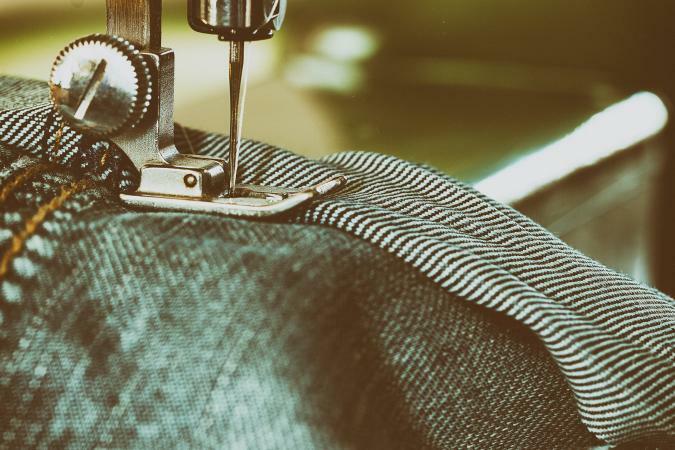 There are a lot of sewing machines that claim to be "heavy duty" or have the capability to sew through denim fabric, but they may not produce consistently good results. You need a model that has enough weight and stability to keep from moving on the table or skipping stitches, and the motor needs to be strong enough to power through tough material. If you know you'll be sewing a lot of jeans, it's best to purchase a machine specifically designed for the task. 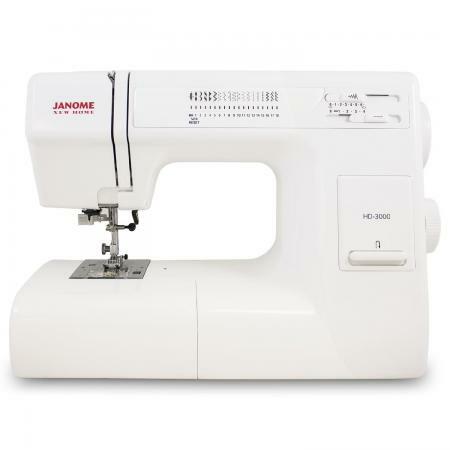 Selling for about $500, the Janome HD3000 is a good option if you regularly sew denim and need a machine that can handle the task with professional results. It's a bit on the expensive side, but it's a good value for an intermediate to advanced seamstress who will use it frequently. A 1.0-amp motor lets this machine power through up to seven layers of denim without trouble. A top speed of 860 stitches per minute is more than enough to whip through most denim projects. With 18 basic stitches and an easy, one-step buttonhole, you can tackle any project that doesn't require a lot of embellishment. A weight of almost 19 pounds and a cast aluminum frame, this machine won't budge on your sewing table - even if you are sewing through several layers of denim. A stainless steel plate keeps jean fabric gliding smoothly, and a presser foot that lifts extra high allows you to sew through multiple layers of thick fabric. A hard case protects your investment and keeps everything dust-free between sewing sessions. A 25-year warranty has you covered for a long time to come. At about $500, this is an expensive machine. If you won't be sewing jeans all the time, you may not need to make this kind of investment. The weight of this machine makes it ideal for big jobs and heavy fabric like denim, but it's a lot to maneuver. If you need to carry it up and down stairs or want something easier on the back, this is not the model for you. This is a mechanical machine without a lot of fancy options. If you want to embellish your jean projects with decorative stitches or embroidery, you should choose a model with more stitches. Some consumers have noted there's a learning curve with this machine. It's not aimed at beginners, and it may take some practice to learn to thread it properly and adjust tension. 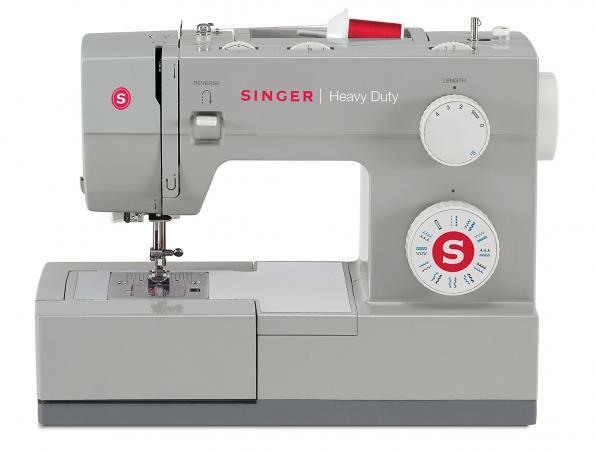 At about $130, the Singer 4423 is an affordable option for sewing heavy duty projects like jeans. You won't find tons of decorative stitches or all the bells and whistles you might expect on a costlier machine, but this may be the ideal choice if you're on a budget. A 0.7-amp motor has the power to crank through heavy jean fabric. A top speed of 1,100 stitches-per-minute let's you complete big projects in no time. 23 stitches, including a one-step buttonhole, have all your basic needs covered. Weighing in at about 14.5 pounds and featuring a metal frame, it won't jump around on the table while you sew through a couple layers of thick fabric. A stainless steel bedplate allows thick denim fabric to slide smoothly over the machine, keeping your stitches even. The pressure foot lifter is extra high, allowing you to maneuver thick, multi-layer projects with ease. The Singer 4423 has a 25-year warranty, but it may not be designed for daily use. If you're looking for something that will last for decades of sewing jeans, consider an option at a higher price point. This machine doesn't come with a cover to protect it from dust and bumps. You can purchase a cover separately for under $50. You don't get a lot of decorative stitches with this machine. If you'll be using it to hem jeans or sew some basic jackets or skirts, this isn't an issue. However, if you want to embellish your work, look for a model with more built-in stitches. Even though this machine is heavy enough to be stable, its weight may not be enough to handle several layers of thick denim in a large project. Although the 0.7-amp motor is sufficient for most denim projects, you might want something stronger if you'll be doing jean slipcovers or other big, multi-layer jobs. 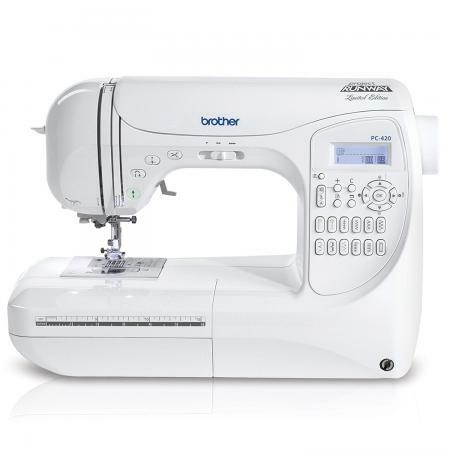 At about $400, the Brother PC420 Project Runway is one of the more expensive options out there for sewing jeans, but it offers a plethora of decorative stitches for those who prioritize design and embellishment in their denim projects. There's a trade-off in terms of heavy duty use, but it's worth it if you want the stitch options. 294 built-in stitches, plus the ability to monogram, give you limitless options for embellishing your denim projects. 10 different buttonhole options allow you to create a custom style with professional results. Twin needle stitching lets you create parallel rows of topstitching in one run, saving time and ensuring perfect spacing. With a top speed of 850 stitches per minute, you can zip through your project quickly. At 17 pounds, this machine won't skip stitches or jerk on the table when you sew through jean fabric. A 25-year warranty protects your investment. An included hard cover keeps the dust off and protects the machine from bumps. Brother does not specify the power of the motor for this machine, but there are complaints from consumers about the machine's ability to sew through many layers of denim fabric. If you are sewing through a couple of layers, this shouldn't be an issue. This machine does not have an extra-high presser foot, which can make it a challenge to work with many layers of denim at once. Priced on the higher end of the range for denim machines, this may not be a good choice if you're on a budget. This is a heavy model, which means it can be a challenge to move from room to room in your home or take with you up and down stairs. Sewing denim is a unique challenge, and it requires the right machine to get top notch results. Whether you'll be making your own jean jumpers and overalls or you do a lot of alterations on existing jeans, you'll need a sewing machine that is up to the task. There's a model out there that is perfect for your needs and budget, and you'll be creating gorgeous denim designs in no time.